week in 1961, 36 total cases (27 paralytic) were reported. ceed the experience for the comparable period last year. by 11 States, none of which reported more than two cases. .A lic m n i ni !t f l ,............... 69 124 --- 944 1,156 .
and Scarlet fever ............ 3,446 2,932 -- 213,798 222,143 . Of the five Illinois cases, only one was paralytic. 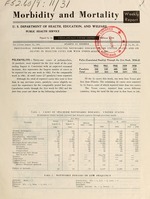 HEPATITIS As of the current week, 35,317 cases of o.
have in particular had striking decreases from 1961. Colorado, have also had a reduced incidence. number of cases was reported during the week ending ~-. July 7, and this may represent the seasonal low. decrease during the second quarter of 1962. (See Figure -. when high rates continued to prevail. katchewan. From stools of three of the patients, S.
kitchen, yielded S. thompson; two samples yielded S.
as compared with an expected 751 weekly average. F I il t : ., P ,, 1 l i. NOTE: All deaths by place of occrrence. Notes: Tbese proviati alea.. r b.id o. weekly telea ius ite Coiu-l.
cabls Dles... Csatr by rhe ladl.ldoal Sci.e h.lIb dlepnmeals. Procred-a r foa .ir .1orcio f .. .ulo ort.I c i ..y b. obltaesd Io..
Sr.ilic. S ac.lOu CoD.ualcbIa. D a ie. CoaIer. Public Hidal Service. U S. D.p.asla of Rel.lh. Edauialo. .ad Wallare. Atlalut 22. GCorgl.